Custom Wave Banners are taking the lead as the best in outdoor advertising. The banner attached to the flexible wave poles will make the image visible with or without wind. The best part is that it will take only a few seconds to install these banners. 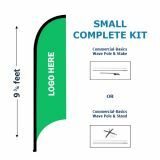 Give a panoramic display to your event with these wave banners that are made of either durable nylon material or a lighter weight knit poly. You can opt for a single face reverse print or a double face print. These attention grabbing wave banners are great to turn heads towards your store front, booth, or event and will make your stand out even in the crowded retail world. Shop from our collection of Digitally Printed Wave Banners. 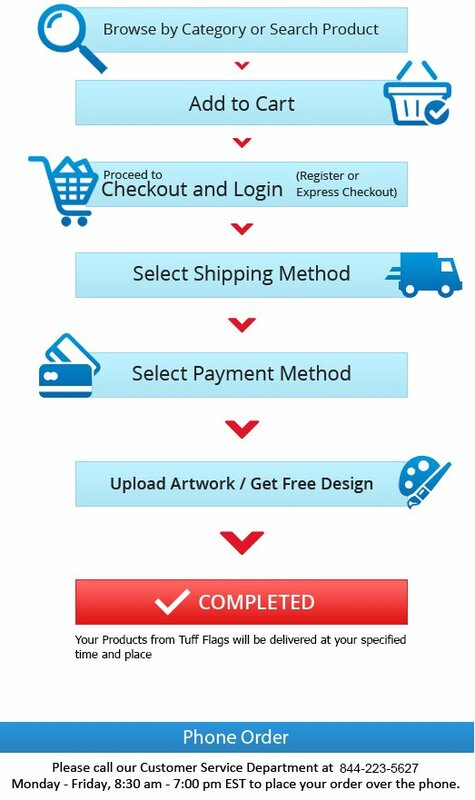 You'll receive the best prices in the market, sensible advice, quick shipping and much more! 100% customer satisfaction guaranteed! Leave a big statement through outdoor advertising with these Customized Wave Banners that are easy to install and can rotate 360 degrees with the wind! Well suited for all types of events including sports events, special occasions, announcing special deals or as retail signage, wave banners are compact and easy to transport and store. 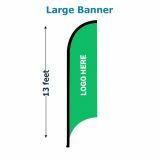 Ideal for both indoor and outdoor display, wave banners act as a moving billboard for your brand. Offered in both durable nylon and poly-knit, wave banners are an economical method to grab road-side attention. Custom Wave Banners are the hottest banner advertising products in town as these high attention grabbers have gained enormous popularity. These are great choices to get your message out in a bold and eye popping way. Wave banners are perfect for the four color process, spot colors and full bleed artwork. You can even use multiple banners of different colors to make a wonderful collage of colors for your brand promotion. Customize these banners with your message, artwork or slogan to leave a lasting impression to onlookers. 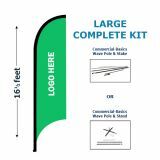 Great for street display and for high traffic areas, these custom wave banners mounted on flexible poles will grab attention with their 360 free rotation features and brilliant color choices. Browse our collection of Digitally Printed Wave Banners. 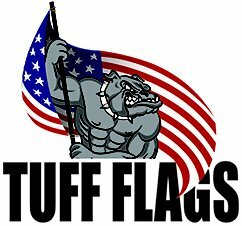 Should you need any tips or free assistance to get your custom design ready, call us at our toll free number (888) 287-3524 or email us at customercare@tuffflags.com and our team will be happy to help you.